The Horse Forum > Keeping and Caring for Horses > Horse Health > Hoof Care > Who knew hooves grew? My eight year old horse has been barefoot most of her life. There was about six months I kept her fronts shod, but ended up going to Renegade boots on the fronts and a year later I got a set for her rears as well. Then I moved to New England where there is a looong winter layover with no riding outside of a covered arena. So now, ice is melting off the trails, I get her a nice fresh trim and go to put her boots on. They won't go on. Wha? They always fit nice and loose after a trim before. I blame my farrier at first (though her feet look perfectly nice), and he informs me that .... hoofs get bigger as the horse ages. Especially if they are usually run barefoot. I am suspicious, so I go out there and measure her feet. They have grown. In fact, since I got those boots three years ago, they have increased almost half an inch across. No wonder those boots don't fit. I had never heard of this, but then, it wouldn't be a notable fact to anyone except someone who keeps their horse in trail boots. Shod horses' feet don't grow as much, and also of course every shoeing gets a newly fitted shoe. Barefoot horses, you'd never really notice. So now I'm waiting for my new, larger, boots to come. Renegade Vipers in Dragon Red. waresbear, Foxhunter, Dustbunny and 6 others like this. Having dealt with a lot of racehorses that have been shod (and more often than not, not very well) since they were two, that when they finish racing and either go to stud or, have three months without shoes out in a field, their feet grow a lot bigger. One mare we had was a hefty mare as in big boned, but had small feet. By the time she had bred three foals her feet were of normal size. SueC, knightrider, Avna and 2 others like this. Big feet = healthy feet! Could be the cold and snow and the ground agrees with her. Morgan's used to be known for their large feet! akihba, SueC, Acadianartist and 3 others like this. Yeah, not complaining about her feet getting bigger, just having to pay for it! I have a friend with a couple off-the-range mustangs. Neither is more than 14.2, but their feet are enormous compared to a typical horse that size. They don't need shoes, or boots either. Filou and SueC like this. 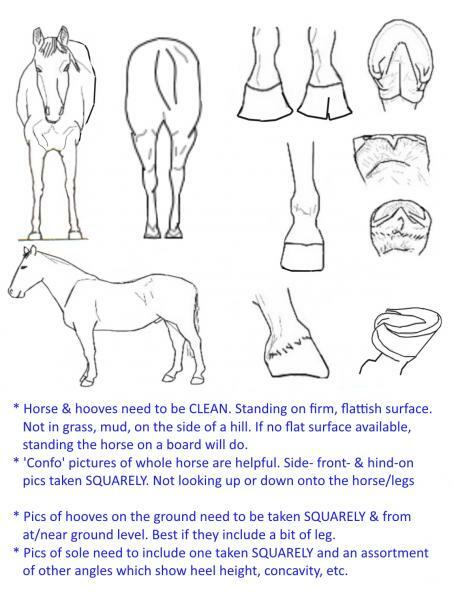 If hooves reach maturity with the horse at around 5, depending on feed and genetics, they must be large enough to support the body. Last edited by Caledonian; 04-05-2019 at 04:17 PM. Well, human feet do too. I mean, most humans , even after reaching adulthood, will increase a shoe size when they get into older adulthood, especially women who carry babies. I used to be a firm size 8. I am now a size 9 or 9.5! And I've been shod most all my life. waresbear, Chevaux, Dustbunny and 7 others like this. Eh, be sure the farrier isn't just allowing flair and long toes, letting the feet run forward.. My old farrier "liked a nice big foot" so he would allow the horse's feet to platter out. The coffin bone doesn't grow larger and everything is pretty much attached to it. I'm rehabbing a mare with plattered feet. She's gone down a full boot size in three months. She's 17.
loosie, SueC and JoBlueQuarter like this. I don't think so. Not seeing flare. Yes, horse's feet do indeed continue to grow until maturity. Pedal bones do not increase in size past about 3yo though. It is the caudal foot that continues to develop(assuming healthy & well functioning). And yes, if a foot is shod young or otherwise contracted, it can continue to broaden when given the chance(if not too damaged) well past maturity. If your horse is on harder ground now, was always on yielding footing before, that could cause it to have remained a bit contracted & they've now finally opened up more. COWCHICK77, SueC, SwissMiss and 1 others like this.